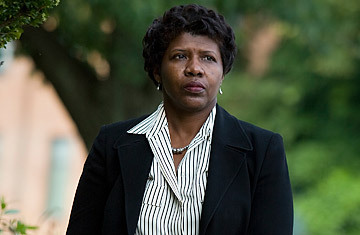 Gwen Ifill, the moderator of the Vice Presidential debate. Gwen Ifill is the moderator and managing editor of PBS's Washington Week, the senior correspondent for NewsHour with Jim Lehrer, and the moderator for the Oct. 2 Vice Presidential debate between Alaska Governor Sarah Palin and Sen. Joe Biden.  As a child, Ifill lived in Pennsylvania and Massachusetts church parsonages, as well as federally-subsidized housing in Buffalo and Staten Island, N.Y.
 She has never married. Of this she has said, "I don't know why I'm not married. I just know I will be, so I don't sweat it"
 Hired as an intern at The Boston Herald. Has said about her internship, "They didn't know what a college-educated black woman was and they didn't know how to treat me."  One day, a Herald staffer left her a note in the photo lab that said "Nr go home." The paper's editors were so apologetic that they offered Ifill a job.  Joined the Washington Post in 1984. Left in 1991 when editors told her she wasn't ready for Capitol Hill. Switched to the New York Times, which assigned her to the White House.  Left the Times to become NBC's Capitol Hill reporter in 1994.  Moderated the 2004 Vice Presidential debate between Vice President Cheney and John Edwards. When Cheney asked for more time to answer a question, she told him "Well, that's all you've got."  Some PBS viewers complained about Ifill's frowning facial expressions after Palin's acceptance speech during the Republican National Convention in September.  On Sep. 29, Ifill was reportedly walking up the stairs with an armful of debate research when she tripped and fell, breaking her ankle.  "Shouting is a good way to foment conflict, but it's not the best way to inform."  explaining, in 1999, why she preferred PBS's understated news delivery to that of pundit-heavy network television.